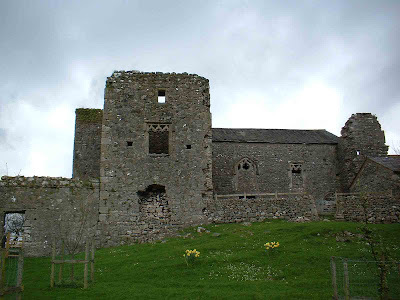 Beetham is a large complex of medieval buildings and walls, sitting about two hundred yards off the A6, and near to the village of Beethom. 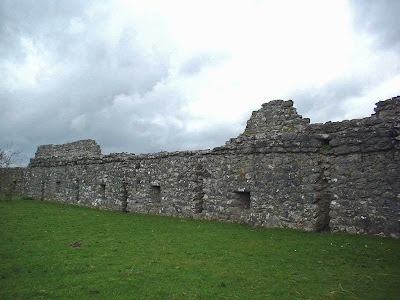 The site consists of the main defensive hall, and a number of out buildings, as well as the remains of a curtain wall with looped holes in it. The curtain wall is around 1 metre thick, and sits between the hall and the road. The hall is now attached to a farm house, and was once an important fortified mansion with a large deer park. The main hall has elaborate Gothic windows, with a great part of the building in ruins. 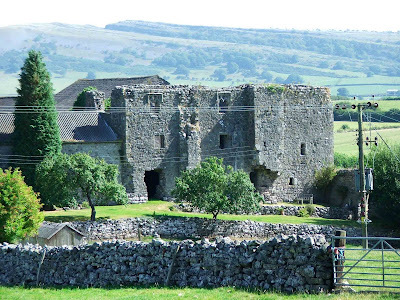 The hall was owned by the Beethams until passing to the Stanleys in 1485. In 1644, it was taken over by a Thomas Fairfax. Eventually it came into the hands of the Clifford family (of Pendragon and Brougham to name a few, fame) Then in 1767 the Wilsons of Dallam took it over. A farmhouse with the date 1653 on its door lintel now occupies the western side of the site. Part of it was a wing of the old priests house. The hall and tower is visible from the A6, and there is a layby nearby from which the curtain wall and the buildings can be viewed. If you undertake the Limestone Link walk, the second part of the walk takes you behind the hall, affording views not usually seen.